Your student is required to complete several forms, all of which are located in their Syracuse Abroad application portal. As a parent, you’ll be asked to sign two of them if your student is under the age of 21: the Conditions of Participation and the Medical Consent and Insurance Acknowledgement. Your student will also be required to read our Preparing to Go website, attend an in-person pre-departure meeting or webinar, and watch several short pre-departure videos (each followed by a quiz to ensure their comprehension). A visa is official permission by a foreign government to visit that country for a specified purpose and a limited time. If your student has been admitted to a Syracuse Abroad center semester program, their Syracuse Abroad admissions counselor will provide them with information (also available here on our website) on how to obtain a student visa. (The common exception is London, most students will not need a visa for study in the UK.) If your student has been admitted to a World Partner program, the student will work independently with the World Partner to obtain their visa. Summer and short-term program students generally do not need visas, but if one is necessary, their admissions counselor will give them the needed information. Ground transport upon arrival: When the flight arrives, local Syracuse Abroad staff will greet the group flight and guide the students to arranged transportation (at no cost to the student). Group flight leader: Most, but not all, group flights are accompanied by a Syracuse Abroad staff or faculty member. These group leaders greet families at the airport, travel on the flight, and are on hand to guide students through flight connections abroad (if needed) and immigration/customs. If you have booked your flights with Advantage Travel, they will assist in re-booking flights if cancelled or delayed. Meeting other students: Traveling with future classmates or roommates gives students time to get to know one another before their semester officially begins. If your student travels independently, they must follow instructions provided by their program about when and where to arrive to meet the rest of their group. Ensure that your student’s medication concerns have been addressed. You cannot mail medication abroad, so your student will need to be prepared with prescription medications for the full length of their stay overseas. Are your student’s vaccinations up to date? Schedule a pre-trip appointment with your student’s physician and dentist. This is your student’s opportunity to discuss any questions they may have that pertain to their personal medical situation in accordance with the location(s) they are traveling to. Students will need to pay upfront for any medical care they receive while abroad; be sure they have a credit card or access to emergency funds should this occur. Review your current insurance policy to see if your student has coverage overseas. Our full insurance run-down is on our website here. Contacting your bank and credit card issuers to research what international fees might be incurred. Figure out how your student will access money while abroad. Check with your bank to make sure your student’s ATM card can be used in foreign countries. Some banks have a partnership with banks abroad which permits members to use those ATMs without paying an ATM fee. Make copies of both sides of the credit and debit/ATM cards going abroad with your student and keep them stored in a safe place. If a card is lost or stolen, you will still have access to the important contact and account information on their cards. For Syracuse Abroad center semester students, our office will provide detailed recommendations from the staff and alumni of each center. There are a variety of apps that are free to use for international communication with access to WiFi – Viber, WhatsApp, Facebook Messenger, Skype, etc. It is important to set up a plan with your student now, outlining your communication expectations. Be realistic in your expectations. Your student will be busy in their new international setting and not as accessible as they are in the States. Time differences also add difficulty, so plan for that as well. Syracuse Abroad provides general packing information for center semester students here and for world partner programs here. We strongly advocate that students pack one suitcase, one carry-on, and one personal item (a purse or backpack that can fit under the seat in front of you on an airplane). It is also essential that you and your student research the specific requirements of the airlines your student will be flying – they vary from airline to airline. We offer our general guidelines because 1) we want to make sure students avoid extra fees; 2) students will need to be able to maneuver their own luggage when they arrive without help from others; and 3) recent abroad alumni tell us all the time that they wished they had packed less and left more space for the items they bought while abroad. For Syracuse Abroad center semester students, our office will provide detailed recommendations on their OrangeAbroad portal from the staff and alumni of each center. 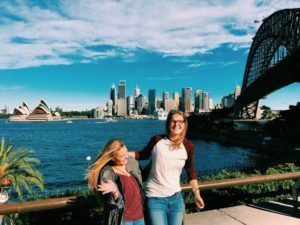 Global ambassadors are a fantastic resource if your student has questions about day-to-day life, living with a host family, the best places to find cheap food, and must-see travel destinations. Have your student reach out to them before they leave!